Feel that your jokes have been falling flat lately? Enough that you’ve even started wondering whether China is a grand experiment in irony and deadpan humor? This week on Sinica, hosts Kaiser Kuo and Jeremy Goldkorn are delighted to invite guests David Moser and Jesse Appell on our show for a discussion on the differences between Chinese and American senses of humor, asking why these two cultures feel so different and where—if anywhere—they meet? If you are a longtime Sinica listener, you’ll already know David Moser as a regular guest on our show and as Director of the CET Immersion program in Beijing. You may not be aware that David also studied Chinese crosstalk with Ding Guangquan and has written on Chinese humor in the past. 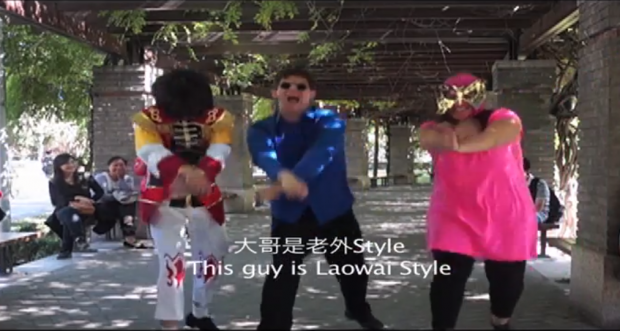 Jesse Appell has also given a lot of thought to this subject, first as an academic doing research of contemporary Chinese humor, and second as the producer of a “Gangnam Style” parody video that ended up spreading through the Chinese Internet.